The 100% Non-Stick Miracle Grill Mat is an indispensable cooking accessory for all your grilling! Food simply slides off its PTFE (PFOA-Free) coated non-stick fabric! Ideal for use in the home, outdoors, kitchen, camping and more! Great for grilling vegetables, meats, fish & seafood, pizza, kabobs, sausages, bacon, marinated foods sticky & glazed, chicken wings, ribs, eggs, pancakes & crepes and much more! 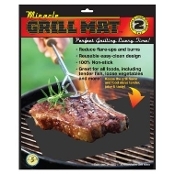 The Miracle Grill Mat makes clean-up a breeze; simply wipe clean or wash with warm soapy water. Easily store away loosely rolled or flat. Can be cut to fit needed size.